British Prime Minister David Cameron arrived in China saying he would advocate a multi-billion-dollar free trade deal between Beijing and the European Union, stoking tensions with the EU executive which condemned the move as premature. On a three-day visit with around 100 business people, the largest-ever British mission of its kind, Cameron said Britain was the most open Western country to Chinese investment and was well-placed to take advantage of China's market liberalisation. "China's transformation is one of the defining facts of our lifetime […] I see China's rise as an opportunity, not just for the people of this country but for Britain and the world," Cameron told reporters after meeting Premier Li Keqiang at the Great Hall of the People in Beijing. He cast Britain as far more progressive on trade than other unnamed EU member states in remarks that stirred a growing spat with Brussels over the issue. "Some in Europe and elsewhere see the world changing and want to shut China off behind a bamboo curtain of trade barriers," said Cameron. "Britain wants to tear those trade barriers down." His line irritated the European Commission, which is privately understood to oppose such a move on the grounds that it risks flooding the 28-nation bloc with cheap Chinese imports. "We believe that it is premature at this stage to discuss a free trade agreement with China," Alexandre Polack, a spokesman for the EU executive, told reporters. He said the EU and China were already discussing a possible investment agreement and should stick to that for now. At home, Cameron's initiative is likely to be seized upon by opponents as he has placed a question mark over Britain's EU membership by promising a referendum on leaving the bloc if re-elected in 2015. That sits awkwardly with his drive to help broker a deal for a club his country may be about to leave. "I've said to Premier Li that I will champion an EU-China trade deal with as much determination as I'm championing the EU-US trade deal," Cameron said. Li said both sides had agreed to fight protectionism and push for trade and investment liberalisation. China, he said, welcomed Britain's open attitude to Chinese investment, especially in the nuclear power sector. Li said there had been a "breakthrough" between companies on both sides on high-speed rail, but gave no details. His comments fuelled speculation in Britain that Chinese firms might play a role in plans for a high-speed rail link, dubbed HS2, between London and the north of England. Cameron's office said he was the first European leader to champion such a free trade deal, saying he had discussed the issue with other EU member states. The deal would address services liberalisation and intellectual property rights. British finance minister George Osborne opened the door to further Chinese investment during a visit to Beijing last month. He announced less stringent rules for Chinese banks operating in London, in a push to make the British capital the main offshore hub for trading in China's currency and bonds. Osborne also paved the way for Chinese investors to take majority stakes in future British nuclear plants. Campaigners have often accused Cameron of putting trade before human rights. On this trip, activists want him to raise what they describe as rights abuses in Tibet. A senior source in his office said before the trip that Britain had turned the page on a rift with China over Tibet, and that Cameron had no plans to meet the Dalai Lama, Tibet's exiled spiritual leader. Their encounter last year angered Beijing. Before meeting Chinese leaders, Cameron was non-committal about raising Tibet, but said no subject was "off limits". As permanent members of the UN Security Council, Cameron said the two countries would also discuss Iran and North Korea. 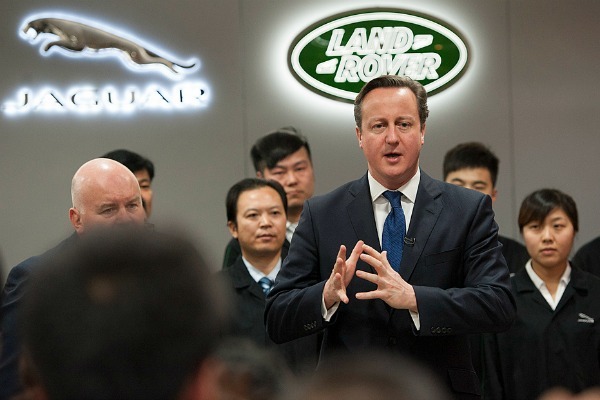 Cameron visited a training academy for Jaguar Land Rover sales staff on Monday to mark its opening as the carmaker unveiled a deal worth 4.5 billion pounds (€5.44bn) to provide 100,000 cars to the National Sales Company in China. England's Premier League also announced an agreement with the Chinese Super League to develop football in China. The delegation includes Andrew Witty, the chief executive of GlaxoSmithKline. The company was drawn into a bribery case this year which resulted in police detaining four Chinese GSK executives. Peter Humphrey, a Briton running a risk advisory group, was also detained and is still being held. 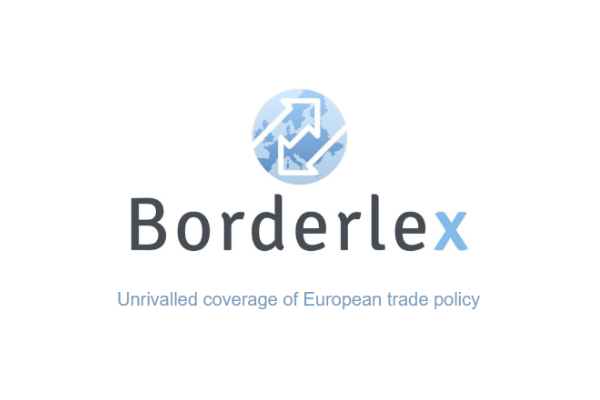 China and the European Union announced on 21 November 2013 that they will begin talks on a landmark treaty aimed at boosting investment that lags behind burgeoning trade and at tackling thorny market access issues. Europe is China's most important trading partner and for the EU, China is second only to the United States. But the bilateral relationship has been weighed down by a series of trade rows ranging from steel and wine to solar panels. In 2012, bilateral trade in goods and services reached €483.5 billion, according to the EU delegation to China. China exported €289.7 billion in goods to Europe last year to Europe's €143.9 billion in goods to China. However, EU imports from China last year decreased for the first time since the financial crisis, falling 0.9%. EU officials say the planned investment pact is a test of China's willingness to compromise and play by rules set down by the World Trade Organization that ban subsidising of companies to undercut foreign competitors. The problem is, that with the EU now so inefficient the commission fear they will be shown up as incompetent federalists when measured against China. Strangely, the EU regulations, many initiated by the commission, is the reason why China has an advantage, but the EU exec’s refuse to stop creating a federalist state wit ever more socialist regulations. Unelected foreigner at eussr interferes with elected national leaders attempt to aid his own country. this is why we need to get out of this costly corruption ridden democratically deficient entity as soon as possible, never mind a maybe 2017 lets have the vote now. Why the UK won’t have the referendum tomorrow? Please please make it as soon as possible. We, Europeans, are fed up with the short-sighted populist Cameron, with his corrupted undemocratic “Spoke In The Wheel” Kingdom, with all these arrogant British europhobes, with the eternal whining about Brexit, with all this sh#t. Britons, please leave us and let us do our business. The whole thing sounds like a bit of a backstabbing move to me, but that’s what this kind of politics is all about, it’s to get the advantage on your competitors, and Cameron is clearly presenting the UK as being in competition with the EU here. A move designed to deliver some short term gains for themselves, but the long term consequences are not being considered. Otto the eussr is very good at doing its business, which in the UK is a term for excreting solid matter in the toilet, the eussr is very good at creating excrement. Trust me I would leave it yesterday given the opportuinity. Gerry the eussr has backstabbed the UK since the day we got dumped into it on a pack of lies, Cameron has no intention of getting us out either because like all politicians when it comes to the corruption ridden democratically deficient eussr, he realises that the truth is going to show what a bunch of morons we have rubber stamping edicts from this unelected foreign government. All this just leaves me wondering; is there anybody out there who is not engaging in hate speech yet? I actually think that was a very smart move by Cameron who is trying to build bridges with the Chinese, especially after the diplomatic incidents over the Dalai Lama. In fact, he is just catching up with Germany & France, which up to now have been much more aggressive in forging trade links with China. In effect, his ‘EU-China free trade’ talk are just throw away comments. But they play well to the Chinese because trade is something close to their hearts. He probably made the comments knowing full well there will never be a free trade deal between the two. But the important thing is that it went down very well in Beijing and builds goodwill for the UK in China – that I believe was the real purpose rather than getting a free trade deal. The fact that European Commission then went on to castigate him only reinforces his position from the Chinese perspective that the UK is one of the most open, progressive and forward looking countries in the EU. And that’s exactly the message Cameron was trying to convey to the Chinese. There is also no real cost to him in the EU for making those remarks. After all who cares if it “irritated” the European Commission. A nice bit of diplomacy by Cameron. Justin – I like your take on this…. For me this demonstrates all too well one of the failing principles of the EU – The tail wants to wag the dog – The commission has far too much say and needs to be downgraded. National governments should be more in control. When it comes to the EU there is such a fatalist attitude by some who see only one path for EU countries which is to merge into a federal republic and be dominated by an elite that doesn’t have the good of all nations at heart – they simply want full control …. they say “Oh UK, just lie down and accept your fate”. They don’t care that things could be better, or that the UK has something to say. It seems they just want to perish quietly, without fuss, and as soon as possible. “For me this demonstrates all too well one of the failing principles of the UK – The tail wants to wag the dog – The British parliament has far too much say and needs to be downgraded. National governments should be more in control. When it comes to the UK there is such a fatalist attitude by some who see only one path for Scotland, England, North Ireland and Wells which is to stay in the United Kingdom and be dominated by an elite that doesn’t have the good of all nations at heart – they simply want full control …. they say “Oh Scotland, just lie down and accept your fate”. By the way, there is nothing wrong about the idea of the federal Republic of Europe. Firstly, if you accept the idea of The “KINGDOM of British nations”, so you logically should accept the idea of the “REPUBLIC of British nations” etc. You know, kingdoms are usually less democratic and more centralized than republics. Secondly, please take a look on Switzerland. Some centuries ago it was a EU-like organization of independent nations with different languages and cultures. Today it is a successful united nation. Otto maybe if you bothered to read what other people have to say you would realize that you are talking junk. The position of Scotland within the UK is nothing like the position of the UK in the eussr. The British Government has allowed Scotland and Wales more say in their own nations governance, even to the point of allowing the Scots a referendum on their independence, because a minority have asked for it. The eussr is adamant that the UK can’t leave the eussr, and the unelected president Barosso has made several threats regarding this position. No one has told Scotland to lie down and accept anything. If you think that the Scots are without a voice ask yourself this question, Why have the last 3 British Prime Ministers – Blair, Brown, Cameron – all been of Scottish origin? The UK has been around for centuries, the failing eussr will go the same way as the original version and collapse probably with bloodshed, because of the amount of mistakes that haven’t been learned from the original version. Not all interesting or even similar – Perhaps you want to apply this to Spain as well. Thanks Barry – You said it so well. @Otto as regards historical merging of states – Again these have been different to what is being done in the EU…. Switzerland evolved to what it is now, as did the UK because the component countries had lots of things in common – they shared similar attitudes and ways of living…. The EU on the other hand is a bunch of countries with very little in common – the smaller ones only join to get their hands on EU money, while a central elite is pursuing an agenda that they insist is the only way forward and it must be federal. The EU is a botched political experiment. Your democratically deficient corrupted political failure of Kingdom can leave the EU any time – see the exit clause in the Lisbon treaty. I would not be surprised if the UK will use army (probably with bloodshed) to stop the exit of Scotland, like Russia used force recently to stop the exit of Chechnya. Don’t forget, The “United Kingdom of Great Britain and Northern Ireland” is only 91 years old. Some of your fellow citizens are actually older than your country. What a truly idiotic comment! Are you serious? There’s no comparison between the two cases. There’s absolutely no way England would send a military force to invade an independent Scotland. Why allow them to have a referendum over independence then? Besides Scotland only accounts for something like 8% of the UK economy & population. Independence probably wouldn’t change that much for either country. What would be interesting is the kind of chain reaction Scottish independence could trigger elsewhere in Europe. It could encourage the break-up of Spain and will certainly agitate Corsican and other nationalists. Basically it will encourage independence movements all over Europe. I suspect Spain, Italy, Belgium and France are far more concerned about the implications of Scottish independence than the English are. You base your insults on nothing but your own spite – with attitudes like that is it any wonder we question the motives of our European “partners”? If Scotland does leave the UK there will be nothing to fight over… but most Scot’s will not take the chance of being alone, and having to fight for an EU place before they can queue up for the benefits. The sensible will realise they have more in common with the rest of the UK than they ever will with the EU…save perhaps for that desire to dip into the big pockets of the EU. As ever Otto your depraved rantings are incorrect Ireland became part of the UK in 1800 when the correct term was Great Britain, the island which contains England Scotland and Wales, and Ireland. In 1922 which no doubt is what you are referring to Ireland as a whole seceeded from the United Kingdom, the following day the six northern counties seceeded from Ireland and rejoined the UK, by the democratic choice of that nation, so if you are referring to Great Britain and Northern Ireland only being 92 years old you are only right about the name, not about the actual facts. A large proportion of the British army is actually Scottish so again your numbscull rantings are incorrect. Yes there is a clause in the constitution which was illegally forced on to us after being democratically rejected which “allows” a nation to leave, but is couched in such vague terms whether it would be easy is debateable, it has a time limit of two years of being retained in it whether we want to be in or not for a start off. that would cost us billions to stay in still supporting the parasite nations. The EU politicians and mandarins should be irritated as they are one of our main problems and where they have indirectly put the ‘great’ in China and taken it out of (great) Britain. In six years time China will become the No.1 economy in the world according to the IMF and Citigroup and around $23 trillion in nominal terms. In PPP terms it will attain this No.1 position in 2016. Some 33 years ago in 1980, China’s economy was a mere $202 billion using equivalent 2012 base prices or only 1/114 of what it will be in 2019. Who says communism does not pay? But why has the West gone the opposite way and where we have accumulated vast unrepayable debt over those years unlike China that has now amassed officially around $5 trillion in foreign reserves and going up by the year? Some economists say that it is double this figure. It appears therefore to me to be a situation of its own making where the West through the driving force of its investors and corporates to make profit, have shot themselves in the foot long-term. But where some say that profit is another word for sheer greed. For now these same western companies are being bought up throughout the EU and the USA if anyone undertakes a Google search of what is happening around the world. Indeed China is buying strategic western businesses at an accelerating rate of knots and where western government debt is also being mopped up by Chinese money. In this respect it is estimated but unofficial by some leading European institutions that China has now bought up 25% of all the Euros in the world. Adding to this Chinese investors have been buying up real estate for quite a few years now like it is going out of fashion in the USA, buying up the world’s coal and many other natural resources and basically buying everything that moves or stands still. All this at its base through western money and one does not have to be an Einstein to see where all this is leading. The words that come to mind are ‘master’ and ‘servant’ and where western governments and corporates appear to have sold the people in the West down the proverbial swanee river at the vast expense of their people for the last three and half decades. But things are going to get far worse unfortunately and where we should have been investing in jobs in our own countries and developing our great innovative talent. But again that now is even being bought up by the Chinese again and Cameron’s recent Chinese visit is just a swan song to what a disastrous socio-economic mess that our western political and corporate business leaders have got us all into in a relatively short period of time. What a load of c…. This guy is clearly out of solutions and incoherent… sometime ago he was speaking/threatening of taking UK out of the EU, now he acts as he is leading everything and everybody. I wonder what UK’s reaction would have been if some other Member State would have dared to engage the EU like that with a foreign county, without consulting the UK’s wise prime-minister…. Why on earth shouldn’t Cameron say such things – every other EU PM does similar things….but of course, you would only criticise the UK for daring to stand up for their interests. With this attitude is it any wonder that the UK people are sick of the EU and its sycophants. Thomas don’t be fooled Cameron is a dyed in the wool europhile his offer of a referendum in 2017 if he gets re-elected is simply a means of trying to get more votes to win the election, he has no intention of ever giving us a referrendum, if he did we would be having it now. But TBH, I wouldn’t trust Ms Ashton to negotiate anything – She is a lifetime sitter in quangos – has never been elected to anything and IMVHO has neither the talent nor skills to perform her role. Well the other commissars are all failed politicians so not a lot of difference, it seems that politicians like to reward failure if it is a politician that fails. All these so-called wise people history has shown are the absolute opposite. No experience of the real world only talk, talk, talk but where they are handsomely rewarded for political birth to their death. Unfortunately the party system likes puppets (yes people who have done nothing in chivvy street and are just there to put up their hand for whatever the party wants), not people who have the creative talents that can move a nation’s people forward. Unfortunately with our politicians being mesmerised by big business and where these conglomerates can do not wrong, they have let the nations that they represent down big time. Indeed if you look at the current EU-US trade agreement it gives total power to the corporations and where sovereign governments have not redress. This madness alone by our political classes will only make products and services as usual far dearer for the people in the EU and USA. But our politicians will say of course as usual that save huge reductions and lower costs from our corporations. You only have to look at energy prices in the EU to see that the savings when our politicians liberalised the market was a lie as usual. Has anyone ever seen prices come down after similar words were spoken in the long-term, absolutely not? For in this respect one of the conditions of this new trade pact believe it or not is that multi-nations are guaranteed a minimum profit and if they do not get it they can sue sovereign governments for it (you and me who pays up through taxation, something that our politicians seemingly do not understand but if it were their money they certainly would). How absolutely mad can that be for the people of Europe and the United States of America. Overall we the people would be far better without the party system as that in truth is what runs nations, not the electorate’s choice of what they would like to see happen. About time that everyone voted for independent political candidates as they could not do any worse. Indeed if you look at the UK alone but where all western nations mirror Britain to a great extent in the ‘real’ world and where the actual debt bill is not covered up, it will have in excess of $16 TRILLION in debt by 2015 according to PwC and where our the financial debt of our banks is nearer $5 trillion alone. Personal debt of the people is nearly S4 trillion and corporate debt even greater. Overall our politicians could not organise a piss up in a brewery and where they only make things far worse for the people year-on-year. It is therefore time it appears that people realised what a huge mess these politicians of ours have got us all into. But of course the ‘cover-up’ continues indefinitely for the people who only know 10% of what is going on if that as our politicians never tell the truth now do they? We definitely have to get more intelligent and creative people in politics but where again, the party system precludes this ever happening. The EU with or without the economic pact with the US will still be on a downward economic spiral with these political party animals in control. For stagnation and far lower living standards for 90% of the 500 million+ EU citizens is the future I am afraid but where our politicians will be the last man standing to lose out in getting paid and all out of that lovely piggy bank provide by taxation through the people’s hard earned cash. You could not make it up but where reality says that this is the case throughout the EU. Were you referring to the current EU/US negotiations or the “TRANS-PACIFIC PARTNERSHIP” that seems to exceed even the bad things you have pointed out. I was assured by my MP that we in the UK will not be joining TPP… From what I’ve read TPP makes it possible for corporations to sue countries for all manner of things..but fundamentally will be able to over-ride national laws … Sound like a nightmare scenario to me. Yes it is the same ‘big’ one Bryan. We are being led into negative territory again and where 99.9% of the people are not even aware of what our politicians are up to or undertaking supposingly under the guise of their benefit (what a joke that is if it were not so serious financially in future times for most families who will have to pay for all this Politico-corporate madness (and sheer greed)…but of course it makes perfect sense to our bureaucrats, politicians and corporate leaders). Talk about politics by stealth and ruled by the global corporations where a mere 2,000 of them already controlled 51% of the world’s economic turnover last year according to Forbes. The mind boggles and no wonder that the 10% of the richest people are getting richer by the year (who are basically driving the system)and the other 90% are getting poorer by the year through reduced standards of living. A recipe in future times for civil wars et al I believe based upon history and what is on the horizon from SE Asia’s take-over of world economics. We warned of this emerging situation in 1992 but no-one in power thought then that China would ever become a major competitor of the US, not ever. Just shows again how complacent/ill-informed our politicians are and where all that they can see even today is opportunities with China becoming the no.1 economy. But the question is who are the opportunities for, the 10% rich who can never spend their accumulated wealth (at base level provided by the people buying their goods and services)or the 90% poor. I can hear the guillotine being sharpened as I post this reply. Blair, the stable master of the four horses of the apocalypse who on his watch allowed the UK to be decimated economically after boom and on the table of a party’s philosophy of lend, lend, lend like there was no tomorrow. He will eventually go down in history not only as the PM who told porkies about WMD and took us to an illegal war but the man who sunk a nation long-term aspirations and a future for their young. Good luck to him and were according to rumour made £20 million last through his highly secretive Blair Associates…you won’t see any mention on it on his official and extensive website, I wonder why? blair does of course epitomise everything wrong with the political elite, but he was just one of many where lies and falsehoods were just normal business. What is amazing though is the way so many people have realised the extent to which we are being betrayed…. It’s almost like a race…will the rationality within the population rise to a high enough level to prevent a future based on effective slavery to an unelected elite … or will the suppressives win and take over our lives and everything else! That is the struggle yet to unfold but where history records that with such struggles the side with the overwhelming numbers always wins the day. The problem is that the majority of the new leaders elected by the people were/became despots and why this problem needs ultimate research for the good of all future humanity. Jumping out of the frying pan into the fire comes to mind and where history says that this is the usual case unfortunately. There again only possible through control of the armed forces once a new leader is elected and therefore the military should be sworn to obedience to the people, not the country or its leader. Life for most people is about being happy with the environment that we live in. That mainly revolves around family values and the happiness that the family brings. Many things are the reason for human happiness but where a dynamic society for jobs and family security rate very highly in the overall picture for attaining personal fulfilment. Indeed jobs are the supporting mechanism that provides society with their family’s ultimate security, as without jobs there is loneliness, sadness and in many cases, great family hardship. No-one can guarantee jobs but where if we look at how Western governments and our largest businesses have operated over the last thirty-five years they have literally thrown jobs away for their people. In this respect these jobs have been sacrificed one way or the other on the great altar of vast medium term profit and the personal greed of the very few that drives this continual degenerate system for humankind. Indeed a mere 33-years ago in 1980 China had only a GDP of $202 billion (at 2012 prices). Today it is heading nearer to $8,000 billion and where in a matter of a few more years will become the No.1 economy in the world with a GDP edging towards $20,000 billion, a near 100-fold increase in just three and half decades. Even today the global economy’s split is just over 50% in favour of the East and where a mere 25 years ago was no more than 25%. Unfortunately again the overall effect of all this has been to reduce the living standards in ‘real terms’ of the vast majority of people who are resident in western economies. This has been caused by unparalleled reductions in ‘fulltime’ secure jobs and where part-time jobs have increased at an exponential rate. Unfortunately again this factual phenomenon will continue in the West and where again in real terms living standards will continue to decline infinitum as China increases its jobs for its own people for decades to come. Therefore western finance through western banks has fuelled this highly concerning situation for the people of the West and where Western corporations have invested trillions of dollars into China and SE Asia over the last 35-years transferring the livelihoods of western people to others. Indeed western governments and our corporations have been fully complicit in this decline in the living standards of western people and where this decline will now continue indefinitely. Even today our politicians do not see what they have allowed to happen as all that they see with China’s growth to global economic dominance is ‘opportunities’. For they still have not learn that China is not a benevolent nation and where it will drive the West into a totally subservient environment, totally reliant for its keep from the crumbs that come off the Chinese table. But if we look at why all empires failed we see a definite trend and where the main elements were the total complacency of their politicians (what we have now and where Nero fiddling whilst Rome burnt comes easily to mind) and the transfer of technologies to others through trade (what we have now again). But the irony of all this massive transfer of economic power brought about by corporate compliant political leaders and the vast investment wealth provided by Western corporations and our banks is that both our politicians and corporations now have to go cap in hand to China et al. Indeed China has been strategically buying into/purchasing Western corporations and buying up Western government debt for two decades now. On top of all this China is buying up the world’s natural resources at an ever increasing rate and where coal alone is a primary consideration. Therefore don’t think for one minute that China is going to reduce its number of coal-fired power stations when they have too according to protocols, as they will simply ignore this milestone and every other one for that matter unless it is in their economic and financial interests to do so. Considering the above the world, other than becoming a more cleaner place to live in, will definitely become far more polluted one. With near $5 trillion in currency reserves constantly rising and a mere 10% debt GDP figure, China has all the hallmarks of a global power in place to conquer whatever it wants economically and in years to come military as well. The EU in particular should be critically concerned about this threat. Indeed when we look at the West today with its huge unprecedented debt level that may never be paid back, all Western economies and their people are legally bankrupt. So what can the West do to reverse this impossible position? Well the first thing is that the people can get their political leaders to listen to them and change their mindsets away for looking at China et al as an opportunity (an opportunity for the very few it has to be said and not the many, as the majority of the people will not benefit) and secondly to start the long-haul back by providing the new foundations for an economic revival. This will not be easy and will take decades to turn back the economic tide, exactly how the Chinese leadership planned their economic global strategy some 35-years ago. Things will definitely have to change and where the world’s largest corporations are growing in the East and declining in numbers in the West. This trend has been going on now for around 20-years and where it is not hard to see why the global economy is now tipped more than 50% in their favour. Indeed in this respect I remember around 10-years ago that an Asian businessman stated that you (the West) have your billionaires, but we shall have the first trillionaire. His words today look as though they will eventually come true as the global economy intensifies and will at least double over the next 50-years. Indeed to show the economic and financial power of the largest corporates presently, a mere 2,000 companies according to Forbes last year controlled 51% of global GDP; some $36 Trillion in nominal terms and leaving only 49% of the economic pie for the rest of the world to fight over (not a lot when the companies comprising of the Forbes 2,000 only employ 163 million people and where the world’s estimated working population is around 4,500 million). It is therefore an appalling statistic that a mere 3.6% of the world’s working population controls 51% of the world’s GDP or in terms of total population a mere 2.3% leaving 98% of people outside this greatest wealth earning sector. Unfortunately it has to be said that this continued and continual economic in human equality is a recipe for major global unrest in future times. So what ultimate force has the West still got that can start the long-haul back and bring back prosperity for ‘all’ people in the West? In this respect when we look at the history of the world we see that all wealth starts when an innovation idea is exploited. Seems simple but where it is a fact. Indeed when we look at all past empires and how they emerged, it was because their innovations were far more advanced than their competitors. For by having better innovations they made their competitor’s products and services obsolete over a relatively short period of time. Therefore our future change for the better for the people in the West has got to include as its No.1 golden economic key, the identification and exploitation of innovation in all its facets. Unfortunately people still consider that governments and our corporations have the right innovation mechanism in place but clearly with the West’s economic decline, they have not. Western governments have to take control of the direction of global trade and where they have not to pander to the wishes of big business and be subservient to the power of the corporation. To do this western governments have to determine the effective global strategy for the West, just like the Chinese leadership did several decades ago for China and so that Western corporations are pulled into line. Economic wars are like military wars even though a single bullet may not be fired in anger. But economic wars are far more devastating over the long-term as they continue indefinitely and where there a master and slave situation emerges according to history if the imbalance reaches a level where 75% of the economic turnover is controlled by a single side. In this case the east and where by the turn of this century if matters continue as they are that will be the very case. The present innovation system that creates all new wealth has to adapt to a new economic model. In this respect a single invention/innovation can literally change the world and create in some cases, the largest global industries in history. As an example the ‘chip’ invented by Jack Kilby and where today it is estimated that the ‘chip’ underpins a global industry turning over $2 trillion a year. Therefore a single technological breakthrough can create vast new wealth and jobs in a matter of a few decades and where history again has shown that this has been the situation. The history of science and technology tells us if we do an extensive and in-depth analysis of global S&T, that the fundamental thinking behind more inventions and innovations that have changed the world forever did not emanate in our universities or corporate R&D centres, but in the minds of independent thinkers outside these elitist confines; indeed up to 75% of all the fundamental thinking. This does not mean that our universities and corporate R&D centres are not vital, for they are. The problem is that they do not have within their economic system a mechanism that harnessed the creative thoughts of Western society and where this is pre-eminently and overridingly vital in the future. Indeed once the indispensible fundamental thinking has emerged Western universities and Western corporate R&D centres can develop the technologies and services that this unique thinking provides. For we are in a war and people in the West should start to understand this fact clearly, a global economic war. Therefore considering everything that is on the horizon for the West the most important step forward that we can do to prevent the collapse of our living standards to a point of extreme hardship, is to provide the creative infrastructure whereby our people’s innovative and fundamental thinking can be liberated and exploited. This to date has never been undertaken but where if Eastern economies adopt such a system and where it is only a matter of time not when, the West would never recover, as this would then be the completion of whole ‘innovation chain’, not just a part as is the currently. Therefore it is vital that the West builds this creative infrastructure first. I disagree with you about the inovation and invention, after all what happens is that china reverse engineer the new technologies then build their own with a blatent disregard for patent laws, then by building the same items cheaper they make their profits. What is needed is to get rid of the brain dead lowest common denominator edicts from the unelected eussr commission so that there is more flexibility in the area. It will not be long before China stops copying like all those previously did in SE Asia and starts its own technologies. Japan et al all started the same way but then started to innovate themselves. Therefore because of the numbers that can get involved with R&D and what the laws of probability state, China will most probably excel like the others. They have certainly taken the word innovation to heart and where three Chinese presidents have stated that china will become the first truly innovative nations. Words are cheap they say but china has all the financial and materialistic resources to do whatever it needs to do I am afraid to say. Indeed if minds are not open to the outcomes, you will most probably be caught out. The Chinese in this respect are some of the shrewdest people and do not underestimate them at your peril. I agree with your assertion concerning patent laws but where the system appears to be impotent against the rising might of the Chinese and where like Cameron, they try to placate them. There is no way that you can address the problem with this mind-set and the Chinese know this. No complaints with David, after all the Russians reverse engineered the weapons they were having shipped in in WW2 and improved the tanks to produce the T34, arguably the most important weapon in WW2. Quite true with the reinforced covering the German shells just bounced of the modified Russian T34s. ingenuity is the mother of invention as they say.